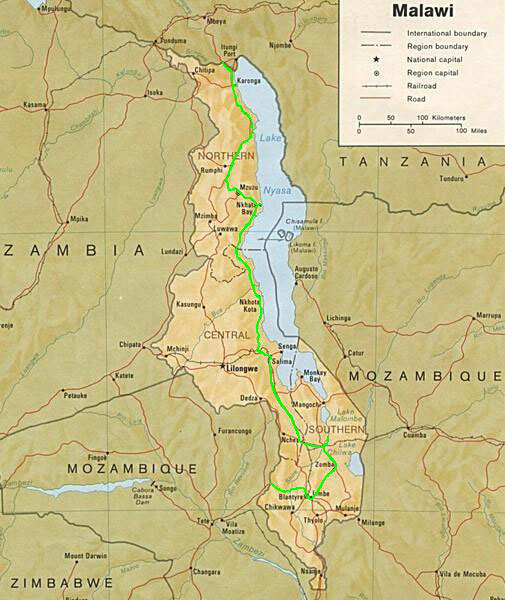 1.100 km Radreise - als Teil einer Weltreise mit dem Fahrrad - von der Grenze zu Tansania nach Süden entlang des Malawi-Sees bis in den Süden des Landes, zum Liwonde Nationalpark, nach Blantyre und zur Grenze von Mosambik. 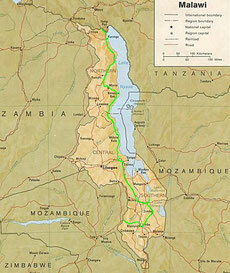 Do you like Cycling Malawi? Crossing the border to Malawi we turned back the clock one hour and with the remaining difference of just one hour I came as close to my home country's time as never before on this trip. We head south, along the western shores of Lake Malawi. 500 kilometres long, with its crystal waters, superb white-sand beaches and its open horizon it appeared to be a sea rather than a lake. In the evenings the small waves calmed down to an amazing mirror-like plain and if one wants to, the stars of the nearly ever clear sky reflected in the waters of the Lake of the Stars. The last time I did had been quite a long time ago and so I finally went again for a scuba-dive, gliding through a fascinating world of dive-throughs, small caves and fishes, partly unique in this lake. Back in our world we based ourselves in a bungalow right at the beach and spent a couple of days mainly with watching the lake's open horizon. Eventually we had to force ourselves to keep on going further south. After a couple of phone calls to embassies and chats with locals we once again spontaneously decided to change plans by not turning westwards to the capital Lilongwe and going on to Zambia, but instead heading further south, crossing through Mozambique and facing the risk Zimbabwe. Before cycling to Blantyre in Malawi's south to apply for the Mozambique visa, we made a loop to Liwonde National Park. Having pitched our tents, we went for a canoe safari. On mighty Shire River we saw hippos, elephants, birds and warthogs, gliding for hours through an ocean of waterplants while listening to the sounds of grunting hippos and elephants, safely keeping a distance. Next day we were in Blantyre and wasted our time with an annoying and eventually only the following day successful search for the Mozambique consulate. We got the transit visas and one day later we cycled to Malawi's southern border, a little bit sad to leave this easy-cycling country with its superfriendly and relaxed people.